My mother has a magic way of growing African Violets. She has pots and pots full of the little beauties. Sometimes I call them little ‘buggers’ since I can’t keep the darn things alive for two weeks! But, here I find a way that I can’t possibly fail with African Violets. I can crochet some for myself! Maya at the littletreasures.blogspot.com has created a picture tutorial to share her lovely little violets with all of us. You can see her tutorial here. Clearly Maya is as much a fan of crocheted flowers as I am. She offers several tutorials and free patterns to create them. Her Mini Flowers tutorial is also a winner! 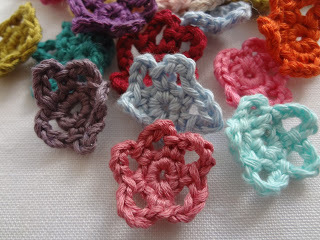 In fact, Maya’s blog is so charming that I spent quite a bit of time browsing through all her posts, finding lots of crochet goodies there. Check it out for yourself. I’m sure you’ll enjoy it as much as I did! This has been a lovely surprise! Thank you a bunch for the sweetest of features ! This was researched and written months ago. I truly do not recall if the tutorial was free at that time or not. But, in any event, people are not allowed to charge for their work – designs, tutorials, whatever. My blog articles are not advertisements. They are often a compilation of great crochet designs and products I’ve found on the internet or elsewhere. I simply had to react to Pam’s comment and write an explanation. 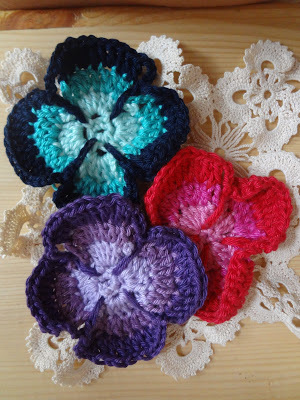 The African Violet pattern was never free – JD featured my mini flowers (which is a free tutorial) and was also taken by the African violet and decided to include that one too in the blog post. I am sorry about all the inconvenience this might have cause JD!